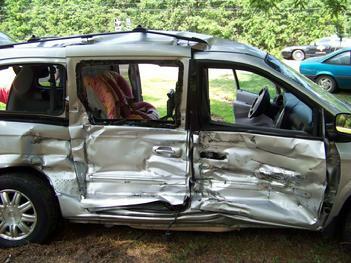 The kids absorbed the brunt of the impact but because they were in child safety seats, they survived this accident. Beautiful Saturday Marred by Ugly Accident, LIVINGSTON, May 24, 2008 - A beautiful Saturday afternoon was marred by an ugly accident that occurred at the entrance of Lake Livingston State Park. According to DPS Trooper Glen Goodwin, at approximately 2:34 pm on May 24, 2008, a silver 2005 Chrysler Town & Country minivan driven by Derek J. Splattstoesser, 30, of Kileen was North bound on Highway 3126 with his wife and 2 small children when he stopped to turn left into the entrance of the park. Splattstoesser failed to yield right of way to an oncoming blue 1993 GMC wrecker driven by Maurice Woods, 51, of Livingston. The wrecker was pulling another vehicle. According to a witness at the scene, Woods locked up his brakes but it was not enough to stop the un-avoidable collision. The truck broad sided the minivan and spun the minivan around as it came to a rest on the west side of 3126. The truck came to a stop also on the west side of the road. A fire engine from Livingston Volunteer Fire Dept. was at the scene and DPS troopers Glen Goodwin, Brent Henry, and Chris Stanbery. The two kids had to be treated by medics with Americare Ambulance service and one of them had to be life-flighted to Hermann Hospital in Houston. According to Trooper Goodwin, Splattstoesser will be issued a citation for failure to yield right of way, and Woods will be issued a citation for no insurance. Both vehicles were towed by Ken's Towing. The accident was cleared out before 4 pm.